Our son (Andrew) was diagnosed with a left sided congenital diaphragmatic hernia (CDH) during our routine 17 week fetal ultrasound. The defect involves a hole in the diaphragm that allows the abdominal contents to reside in the chest, not leaving room for Andrew's lungs to develop properly. 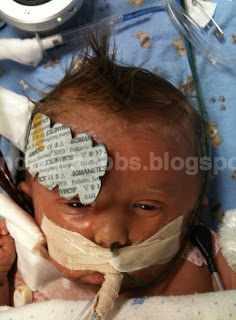 Shortly after birth he was also diagnosed with severe coarctation of the aorta. Andrew's long battle with CDH was cut short by a small bowel obstruction that they were unable to repair on October 30th, 2009. We want to thank everyone who was able to make it to Andrew's memorial service and for your gracious outpouring of compassion, sympathy and love for our family during this difficult time. We are so proud of our Andrew and the tremendous fight that he gave during his short time here. We are forever changed and live for the day we can be reunited with him. Where to begin – I have never known anyone in the world to impact the lives of so many people for good as Andrew Weston Hobbs. His journey began early in 2009, and he was loved and prayed for by hundreds, if not thousands, of people across the world as soon as he was introduced to them, either by his amazing parents, their families and friends, or through the blog his parents created, sharing Andrew’s journey and their hearts to the world on behalf of their precious son. Gene and Becky chose the name Andrew for their son because it means brave – and they knew their son would have to be brave when he was diagnosed with CDH at 17 weeks gestation. And Andrew proved to be just that and more. Everyone said Andrew would have to be a fighter to survive this battle, and he must have heard this early on because he started his kick boxing exercises in utero and boy was he strong! When he was born and we saw the size of his feet, we all had a new appreciation for the kicks Becky and Gene felt from Andrew while he was in Becky’s womb. Andrew was born Thursday, Oct. 1, 2009 @ 8:37 a.m. and the word love took on new meaning for everyone that met him. 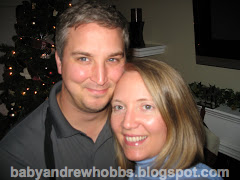 The love on Gene and Becky’s faces was unmistakable, and looking at Andrew was like looking at Gene with Becky’s nose! 9lb.4 oz and a head full of dark hair – he was so handsome! I remember the first time I saw him in the NICU – he was supposed to be still but he was busy looking all around – and when I asked if I could touch him he curled his fingers tightly around my finger and won my heart forever. He was such a beautiful baby it was hard to believe he had such a difficult journey ahead of him, but he proved true to the meaning of his name – “brave” – as he faced heart surgery and CDH repair when he was 7 days old. Throughout his 30 days, his mommy and daddy were beside him, fighting for him, praying for him, caring for him, reading stories to him – his favorite one being “ Guess How Much I Love You”, and holding his hands, imparting their strength and courage to him. And Andrew felt that strength, courage and love and would open his eyes and look right into their eyes, and squeeze their fingers. And what a grip he had! He liked to listen to lullabies his parents would play for him on an Ipod – he had his own headset for quiet times, and he could always count on his mom and dad being there for him, every day of his life, to love him, hold onto him, and stand by his side. It was amazing to see his facial expression when he would hear Becky or Gene’s voice – no matter how sedated he was, when he heard their voices, he would open his eyes and look right up at them, or at times when he was unable to open his eyes, his eyelids would flutter and you knew he was trying to open them, and his fingers would curl tightly around their fingers. 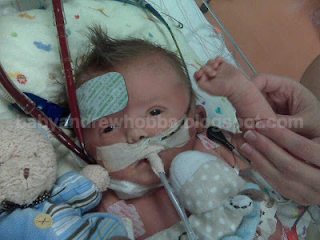 His loving character and cute looks won the hearts of the cardiac PICU staff, as well as the hearts of his parents, grandparents, extended family, and hundreds of people across the country, across the world for that matter, as they joined in his journey. 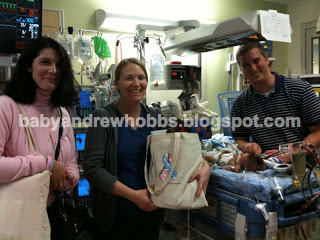 Andrew’s 30 days on earth changed more peoples lives than I have personally ever before experienced. He drew not only our family closer together but hundreds of families closer together. People who had not prayed in a long time turned to God and prayed for Andrew, and experienced a deeper relationship with our Heavenly Father as a result of this, and people learned the importance of making every day count, and to love each other more deeply. Andrew had the best parents God has ever given a child, and the example they have set for us will live on forever. 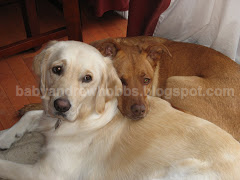 Andrew – your time was short – but your eyes and touch showed how deeply you loved your parents, grandparents, and others. Your parents were with you from the beginning through to the very end of your journey. You remain in their hearts, and in our hearts, forever. We don’t understand why we are here right now, but we look so forward to the day we can be together with you in heaven. In the meantime, we will try to live as you and your parents taught us to: to be brave, to love deeply, and to embrace whatever life brings you with courage. Until we meet again, thank you, Andrew, for these gifts you have given us. As Paul said in II Timothy 4:7 “I have fought a good fight, I have finished my course, I have kept the faith”, so the same is said of you, our precious Andrew. We will be having a memorial service for Andrew on Monday, November 2nd at 6:00 in the afternoon at the Hall-Wynne Funeral Home in Durham, North Carolina. Andrew Weston Hobbs passed away today at 5:35 pm. His long battle with CDH was cut short by a small bowel obstruction that they were unable to repair. Today has been a hard day. Andrew's trial off ECMO did not go nearly as well as last Thursday and no one seems to understand why. He is able to oxygenate fine, the problem seems to be with ventilation and getting rid of carbon dioxide. To look at his monitors while clamped, you wouldn't guess there was any problem, but then when the blood gases come back it is without question that he is back to needing ECMO to stay alive rather than just buying us more time to use lower ventilator settings. With that said, time on ECMO should only make your lungs better or the same, not worse and we are very fortunate that we did not come off ECMO while things looked very promising last Thursday, his right lung would not have been enough to support him through whatever is going on in his body presently. Over the last several days, Andrew's pulmonary hypertension issues seem to be worse and his belly seems to be very distended and tight even though his drain is working and putting out quite a bit of fluid. He has vomited around his nasogastric (ng) tube about once a shift for the last 2-3 days- they did pull his ng tube back some this morning after looking at the x-ray results. They are consulting the pediatric general surgeon to see is he has any other advice or input. Andrew is starting to approach the time frame on ECMO where more complications can develop and the doctors are anxious to try and get him off if at all possible. For that reason, we will be trialing off again tomorrow and possibly for several days in a row hoping to avoid some of the complications from long term ECMO use. These days are completely exhausting and draining for all of us. We hope that you all understand that because this has been so trying, we will probably not be posting as often given that no changes arise. Please know that if there are any major changes, we will definitely be letting everyone know. Thanks so much for the support and the continued prayers for Andrew! It's the same old story; Same old song and dance -- Aerosmith, 1974 "Same Old Song and Dance"
Andrew was given a half dose of surfactant this evening and his hemofilter has been set to pull some fluid off of him. It looks like we will try again on Monday. Today has been a very good day! We trialed off ECMO for the third time today. Andrew's blood gas results looked great for the full three hours that he was off the pump. His blood pressure was a little low but all in all he looked great. We were even sent out of his room so that they could decannulate and take him off the ECMO. In the end, it was decided that a couple more days on the pump could allow for lower ventilator settings (currently maxed out) giving us some room to move once they take the ECMO away. It is amazing knowing for the first time that Andrew could make it without the device that saved his life just three short weeks ago. We are now using the ECMO to allow for improvement more than needing it to stay alive. The next trial is slated for Saturday. Because they decided to leave Andrew on ECMO for a couple more days, they decided to completely redo the sutures holding the cannulas in place. The leaks around them that have been plaguing us for the last few days seemed to have stopped. Andrew is still making urine and his kidney numbers are starting to trend down though there is not much of a change that can be seen yet. We hope tomorrow morning we will see some real improvement. Andrew's stitches from his chest and abdominal incisions were also removed today as well as the other large pleural chest tube. He did need a smaller tube to replace the bigger one but that is still a huge improvement. All of these changes this afternoon allowed for Andrew to be moved a little more easily and his team took the opportunity to clean him up. Below is a picture following his bath. During the bath it appeared that the new gel mattress his nurse Amy picked up from the intensive care nursery also seemed to help the red places on his back. We don't want them to form into pressure sores. We apologize for not updating the blog in a couple of days. We are so grateful for all the support we receive from each one of you and hope that you all understand how tiring this whole process is for us to go through. While I know you are all anxiously waiting to hear the latest on Andrew's progress. I first have to take time to tell my incredible husband thank you and happy anniversary. It was five years ago today that I married my best friend. The vows we took on that day are promises that I am so grateful for today: in good times or bad, in sickness or health, for better or worse. We had no idea five years ago how much we would be going through exactly five years later and how those promises would really be tested. These latest trials have brought us even closer together. While I would not wish the latest experiences we have had on even our worst enemy- I am forever grateful that I have my best friend by my side and want him to know how much he is appreciated and loved and admired! Happy Anniversary! Andrew is making more urine now although the lab values measuring his kidney function have not come down yet. The nephrologist believes that his making urine now is a good sign and that hopefully the still elevated numbers we are seeing are the results from what was done to him over the weekend and that those numbers will eventually decline now that we are giving him the fluid he needs and actually giving his kidneys a reason to function. We attempted to trial off ECMO again yesterday. It was the smoothest trial off I have seen and the staff did a fantastic job! 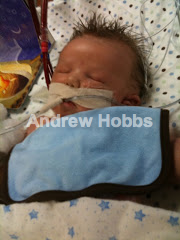 Unfortunately, Andrew does not have enough lung tissue yet to be able to oxygenate his own body. His blood pressure and heart rate looked great and his pulmonary hypertension was not too much of an issue. His monitor did not look bad being clamped for 1 1/2 hours, but his arterial blood gases were more on the devastating side. He does have more of a pleural effusion on the left side that they will most likely drain off today and they will also try another dose of surfactant and hope to trial off again tomorrow. If he does not successfully trial off tomorrow, then the plan is to switch back to VV ECMO (lung bypass rather than lung/heart bypass) which has less risk of complications. He does have two clots on the arterial side of his circuit now which is very scary- they are watching them closely. He is also bleeding from his ECMO catheter insertion site and they will be addressing this as well today. I knew this journey was going to be difficult, but I truly had no idea it would be this difficult. My prayers have become more like begging and pleading that he will be able to survive this. I thought that by this point, the doctors would be having "the talk" with us, but they have not. In fact, they said yesterday that they were encouraged with his progress and hope that his lungs just need some more time. Andrew is writing the books on how this is to be done since this is not the usual CDH pathway due to his heart defect as well- the good news is that his heart is doing really well now! Thanks for all the support you have given us! Also, a special thanks to all my co-workers at the ASC for the incredible gift bag filled with snacks and gift cards for meals, for our great neighbors who left a gift basket at our house yesterday filled with yummy Southern Season treats and a much needed coffee gift card, to the Cherubs Organization for the totebag filled with really thoughtful and much needed PICU survival items, to Brendan and Cody for continuing to mow our lawn, Dr. Ames for getting iv access for us when there was none to be found, and to Kathy for the gifts and for giving us all the many chocolates to be able to give to all the wonderful staff taking care of Andrew! Need to go get ready to see my sweet baby boy this morning. Hope you all have a good day! Born at 8:37 on October 1st. 9 lbs 4 oz. I promise we are still alive! !